Massachusetts Among Safest States for Young Athletes, But Is It Safe Enough? While Massachusetts reportedly ranks third in the country for best practices to keep young athletes safe, a recent study shows much work remains to be done. A new, eye-opening study reveals where Massachusetts ranks against the rest of the country when it comes to protecting high school athletes in the state. Although the Bay State is ranked third in the country for best practices, the NBC Boston Investigators dug into the study and found good and bad news, along with a call to action for parents. Over the next 10 days, thousands of high school football players will hit practice fields in Massachusetts. The Korey Stringer Institute released findings of a new study showing nearly 8 million athletes in all 50 states and the District of Columbia play unprotected. Between 1982 and 2015, 735 children have died in youth sports in the U.S.
"Four causes of death are over 90 percent of all the deaths that happen in sport," said Dr. Doug Casa, a researcher with the University of North Carolina and Korey Stringer Institute. "It's the most important statistic I have for you today." Those four causes include cardiac arrest, traumatic head injuries, heat stroke and exertional sickling. Massachusetts ranks third in the country for practices in place to prevent sudden death in sports, with a score of just 67 out of 100. 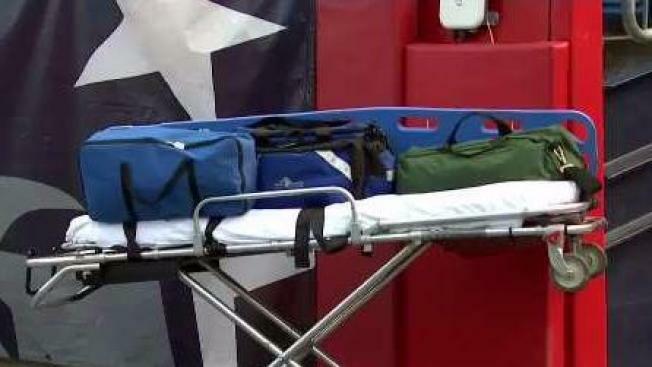 The state scores well for sudden cardiac arrest and requiring athletic trainers to be on site. However, Massachusetts still falls short in three major categories. The state scores seven out of 20 for heat stroke for not requiring cold water immersion tubs on site or to be used to lower a player's body temperature before being transported to the hospital. Casa said heat stroke is 100 percent preventable. "We're talking about $150 tub, and ice and water," he said. "And every high school in America has ice and water, so we're talking about purchasing a tub." The state scores low, just half with 10 out of 20 points, on traumatic head injuries. That is for not requiring Heads Up football training for all football coaches. And Massachusetts scores just half for a lack of an emergency action plan. Bob Gfellar of North Carolina works with the Institute after losing his son in 2008. "I am one of those parents who lost a child. Matthew was a 15-year-old linebacker who in 2008, playing in his first high school football game, received a direct injury a head to head collision, and he was unconscious on the field," he said. "He passed a couple of days later from a major brain bleed." Gfellar has spent years fighting for better change in all states. "You get involved in something like this, you find out everything is about collaboration, because really, the power's at the pro level, but the work gets done at the little guy's level. The middle school and high school level," Gfellar said. He suggests that parents and players take a closer look at the study to see where their state does well and where it needs improvement. Get to know your child's athletic trainer and coaches and look into whether they have completed training. Watch your child's practices. Is there a cold water immersion tub? An athletic trainer? How do they handle a hard hit? The bottom line for parents? Get and stay involved if your child is going to play. The first 10 minutes of response, when it comes to heat, heart and head issues, can determine if a player lives or dies. The National Federation of High Schools is critical of the new study, claiming KSI "proclaimed itself as judge and jury of heat-illness prevention and other safety issues by ranking the 51 member associations," adding that simply reviewing state websites is an incomplete measurement of the efforts. Click here to read the full statement from NFHS. The press conference was held at NFL headquarters in New York. However, the Korey Stringer Institute said that while the NFL is one of its sponsors, the league did not pay for the study.